Having a large collection of vinyl records but worried about the limited space? Or perhaps, you want to listen to your favorite albums on iPods when you’re not at home. This calls for a mechanism that should make digital copies of your LPs. You can always digitize your favorite LPs into MP3 or CD format. In this post, you will learn how to convert your LPs into digital format all by yourself. But before that, you need to understand the hardware and software requirements. The fact that there is no catch-all method for vinyl digitizing can be confusing, and it depends more on the type of equipment you have. Your turntable may not have the pre-amp and you are going to need a receiver with phono pre-amp. A standalone pre-amp will also do the job. The good thing is, modern-day turntables feature USB ports as well as built-in pre-amps which means half of the job is done. With new turntables, you’re all set to convert those old vinyl albums into digital formats. It doesn’t mean turntable with USB port is the only way to digitize your LPs, but if you have one, you can save your time understanding and creating those complicated connections. If you don’t have a turntable yet, here are two sophisticated and relatively inexpensive turntable models you can use for listening and converting your vinyl albums. Audio Technica AT-LP60USB Turntable looks quite simple, but it’s a great turntable with impressive features we discussed above. 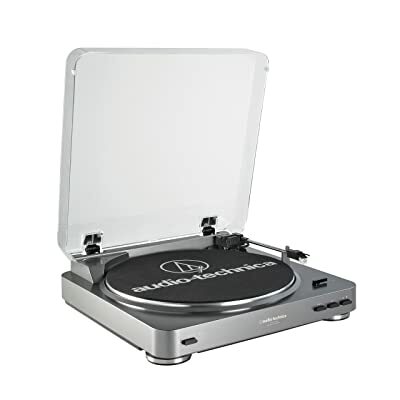 The turntable is compatible with Windows and Mac OS, and offers two speed option (33-1/3 rpm and 45 rpm). Same is true Pro-Ject USB Elemental Turntable that features a DC motor for quite operation, a USB output and a gold plated RCA cable for flawless performance. This model is available on Amazon at around $250, and there are some websites where you can get it on less price. Cables for connecting devices. If the turntable does not have USB output, RCA cable, connector and RCA-to-3.5mm chord. You can buy it at $10 from local store or online. Next thing is computer with “line-in” port. There must be sufficient storage for digital files. If the receiver and your turntable lack phono pre-amp, you have to purchase one. The price of pre-amp ranges between $20 and $1500. So, decide on your own. This is the second phase of the process. You need to find the right software for digitizing your vinyl albums. You have a wide range of premium software to choose from, such as Vinyl Studio and Pure Vinyl, but you can always start with a free software known as Audacity. Exporting the resultant audio files to MP3, FLAC, WAV or AIFF format. The software is compatible with both Windows and MAC platforms. After gathering the required hardware and software, you’re almost ready to begin. Take a deep breath, pat your back then focus on these steps. However, make sure there shouldn’t be any vibrations and noise around the system as it will affect the conversion process. The reason is, any sort of imperfection in the medium will affect the sound quality during recording and digitizing.